Esther and Jonathon Simons on the Bris of their grandson, Shimon Bielinki. Aliza and David Simons on the Bris of their grandson Avraham Lieder. We regret to inform you of the passing of Mrs. Irene Kern, mother of Mrs. Renee Ben-Biniamin. Shiva will be held at the home of Dr. Jeffrey Kern, 119 Bennett Rd., Teaneck NJ, 201-833-2331 until Wednesday morning, December 5th. Anyone interested in sponsoring future Shalosh Seudot should speak to Willie Goldstein, Leonard Mann, or Shaya Rotbard. We would like to have a Kiddush on Shabbos Chanukah (Dec 15th); If anyone is interested in sponsoring the Kiddush; please speak to Leonard Mann or Sheldon Salzberg;. Shulamis and Meir Maslow on Shmuel's Bar-Mitzvah this Shabbos. Miriam and Rabbi Cohen on the forthcoming marriage of their grandson, Yosef Liebenstein to Avigayel Gettinger. Aliza and David Simons on the birth of a grandson to their children, Tzipora and Raphael Lieder. Esther and Jonathon Simons on the birth of a grandson to their children, Elisheva and Amitai Bielinki. Chana and Yosef Cattan on the brisim of their grandchildren, Hillel and Yehuda Leib Yunger in Yerushalayim. Shalosh Seudos sponsored this week by: Regina and Ernie Frenkel to commemorate the Yahrtzheit of Ernie's Father, Yisroel ben Eliezer HaLevi. There will be a Shul Bd Meeting on Sunday, Dec 2; we have important matters to review and urge everyone to attend. Begin saying V'Sein Tal U'Matar at Maariv on the evening of Dec. 4th. Gitty and David Bernstein on the Bris of their grandson, Levi Yitzchok Fertel. Chana and Yossef Cattan on the birth of twin grandsons to their children, Yael and Bentsi Yunger in Yerushalayim. Chana and Yossef Cattan to commemorate the birth of their latest grandchildren and the Yahrtzheits of Chana's father - Yisroel ben Yichya and Yossef's mother - Bahira bat Sarah. Amy and Warren Katzman to commemorate the Yahrtzheit of Warren's father. We would like to have a Kiddush on Shabbos Chanukah (Dec 15th). If anyone is interested in sponsoring the Kiddush, please speak to Leonard Mann or Sheldon Salzberg. This notice is posted on the bulletin board. May the families see much Nachat from Raphael! 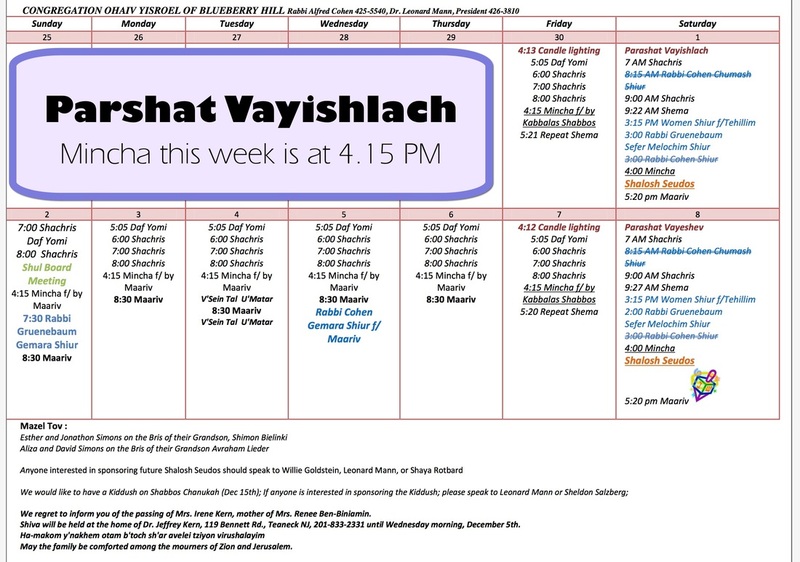 Shalosh Seudot is sponsored this week by Rebetzin and Rabbi Cohen to commemorate the Yahrtzheit of Mrs. Cohen's father. We would like to have a Kiddush on Shabbos Chanuka (Dec 15th). If anyone is interested in sponsoring the Kiddush, please speak to Leonard Mann or Sheldon Salzberg.